It was reported last week that the average full-time pay gap between men and women is at its narrowest since comparative records began in 1997. The difference currently stands 9.4%, which is down from 10% a year earlier. We’ve got plenty of information on this topic below for you. The 9.4% gender pay gap compares with the gap of 17.4% that was recorded in 1997. This has been revealed to be a result of men’s wages dropping faster than women’s in real terms. Hourly earnings figures revealed that in April 2014, women working for more than 30 hours a week were actually paid 1.1% more than men in both the 22-29 and 30-39 age brackets. It has been argued that this is a positive change, as it is “another sign of progress in the fight for equal pay”, says George Osbourne. Full-time median gross pay totalled £518 a week in April, up 0.1% – or £1 – on a year earlier. That is the equivalent of nearly £27,000 a year. 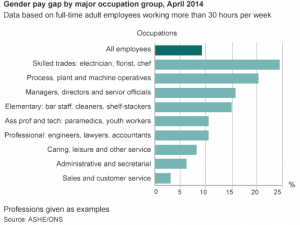 The median average is the mid-point of all wages top to bottom. 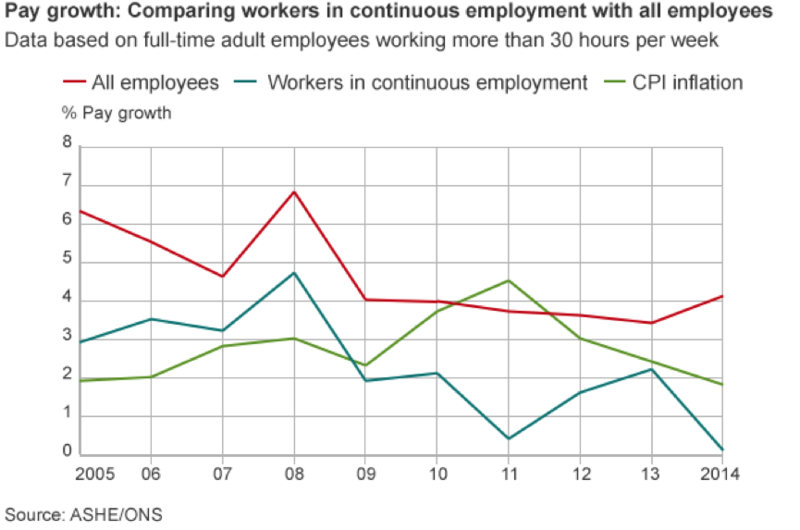 The figures reflect the squeeze faced by workers who have seen wages rise, but prices rising faster. When the rising cost of living is taken into account, real earnings fell over the same period. Wages for the 70% of people who have been continuously in their job for more than a year have gone up by 4.1% in the past year – more than three times the rate of inflation. 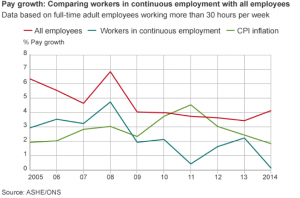 However, those in more sporadic employment – generally lower skilled jobs – have pulled the average wage down. Median gross weekly earnings for full-time employees increased by 1% in the public sector and by 0.7% in the private sector, the ONS said. Gross median pay for all private sector staff was £21,259 and for public sector staff it was £24,302. The figures show that people in the bottom 10% of the pay scale earned less than £288 per week, or nearly £15,000 a year. The top 10% of full-time employees earned more than £1,024, or £53,248. There were 236,000 jobs with pay less than the national minimum wage in April, representing 0.9% of all jobs. About 9,000 of those were held by 16 and 17-year-olds, and 31,000 by 18 to 20-year-olds, new ONS figures also showed.